In God We Trust, Really? 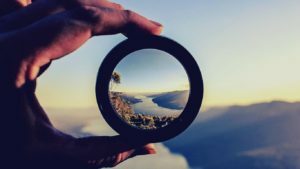 Seeing life through Jesus’ lens, not yours. It today’s western Christian culture, there seem to be many who are questioning the validity of Scripture. The reason for this is that there are passages that seem to go against what some feel are not valid for today’s living. Which scriptural injunctions are for today’s world? And more importantly, who gets to decide? Picking and choosing based on one’s point of view, rather than God’s, is always a slippery slope. If you need examples of this, simply read the book of Judges; and, look at Israel’s history that led to her being removed from the Land…twice. If we believe the words in the Book are from God; then we have to dive deeper when passages “seem” wrong to “us” to get at what God is trying to explain to us. Do we really believe Jesus knows what’s best for us? And isn’t the entire point of faith to trust what He says to do or not do, even when it doesn’t make sense or feel right to us, because it’s for our good and His glory when we do? I’ll bet it seemed pretty crazy to Noah to hear God say build a boat, something he’d never done before, and, to Abraham to go to place where he would only the get the directions to until after he left his home and friends behind. Everyone on this planet lives by faith. The question is, in whom?